Please bear with us while we complete this page of the website. 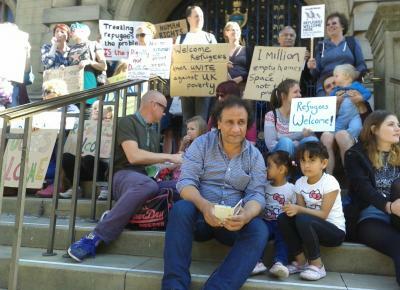 Hundreds of thousands of people have been moved to action by the recent refugee crisis and like in so many other places, people from south Wales are showing the way with offers to help, donate and campaign. If you would like to help, here are some of the ways to get involved. If you’re not sure how best to help you can drop in to the Welsh Refugee Council, Trinity Centre, or Oasis Cardiff to talk to someone. Every local council area in Wales has now pledged to take at least one family from refugee camps on the border of Syria and there is no need for volunteer hosts for this programme. Even if the government are persuaded otherwise, it will not be a quick process to host a Syrian refugee. The UK pledged to take 500 from those camps in January 2014, and up to now only 216 have arrived in the UK, so unless there is huge pressure on government to change policy, many offers of help will not be taken up. Apologies if you already know this, but those who come to the UK and claim asylum (31,000 in total last year) are given accommodation while their case is being heard. That means that there is little opportunity to accommodate them in host families, except for some unaccompanied minors, who may be placed in foster families. If you are interested in doing that, please contact your local social services for information. Home for Good is an excellent initiative working with churches to place children in families, including refugee children. ShareDydd (part of NACCOM) runs a hosting scheme for destitute asylum seekers from all nations who’s asylum claims have finished but are waiting to get evidence for appeals or ‘fresh claims’. The Syrian families will not need accommodation from volunteers so will not need such support. Details of how to get involved with local organisations below. Local organisations supporting asylum seekers and refugees. Even though asylum seekers are housed in ‘NASS housing’ (usually privately run and so not council housing), many have experienced trauma from conflict or the journey to Europe. Many also struggle for different reasons, from cultural barriers, to wanting to improve their education, desiring to know the local community better, and sometimes racism. There are a number local charities who support asylum seekers and refugees who are already living in south Wales as well as victims of human trafficking. These groups are currently overwhelmed by calls so please consider visiting them in person if they have drop-ins or contacting them with a specific request. Please note, these groups mostly support people who are already in south Wales. Local charities supporting refugees are currently overwhelmed by calls so please consider coming down to see an advisor to help work out the best way you can get involved. Also see ‘International volunteering’ below. For a list of what to take, see the Facebook / websites of the groups below. no donations currently needed as amount that needs ‘sorting’ is currently high and volunteers are needed to do this. Discussion around creating a refugee-friendly institution within Universities in Cardiff. Foodbanks are run by local volunteers across the city and many asylum seekers and refugees use their services. Support them by donating food or by volunteering. You can see a number of international organisations who are responding to the refugee crisis at the end of this guide. The following charities support vulnerable refugees and trafficked people. They are generally supporting people who are already living in south Wales and not those who are in Calais or in refugee camps but are in need of funds to support their long term work in Sheffield. Welsh Refugee Council – They will support the Syrian families as part of the government’s programme. See also international organistions to donate to. ● MyRefuge is an exciting project based on the AirBnB principle but not involving any a financial cost to refugees. It will be particularly useful to those who need short term accommodation after having been granted refugee status in the UK while they wait for benefits to kick in and try to find long term housing. ● Positive Action in Housing are compiling a database of people offering accommodation, so that there is a coordinated response if and when refugees are let in to the UK. They may also be able to find you a refugee guest before that happens. ● Citizens UK: a scheme where people can volunteer as much of their time or resources as they want, but especially to lobby local councils on behalf of refugees. Citizens UK has now set up a new national Refugees Welcome Board to coordinate the civil society response to the crisis. They are working at a local level to persuade councils to resettle people, and identify landlords who can make properties available. Local coordinators are now being listed on the new site – we’re almost up to 50! If you would like to be listed for your area email Daniel.Mackintosh@citizensuk.org They have also called for a national action on the 13th of October in Parliament Square to push the government to go further faster.